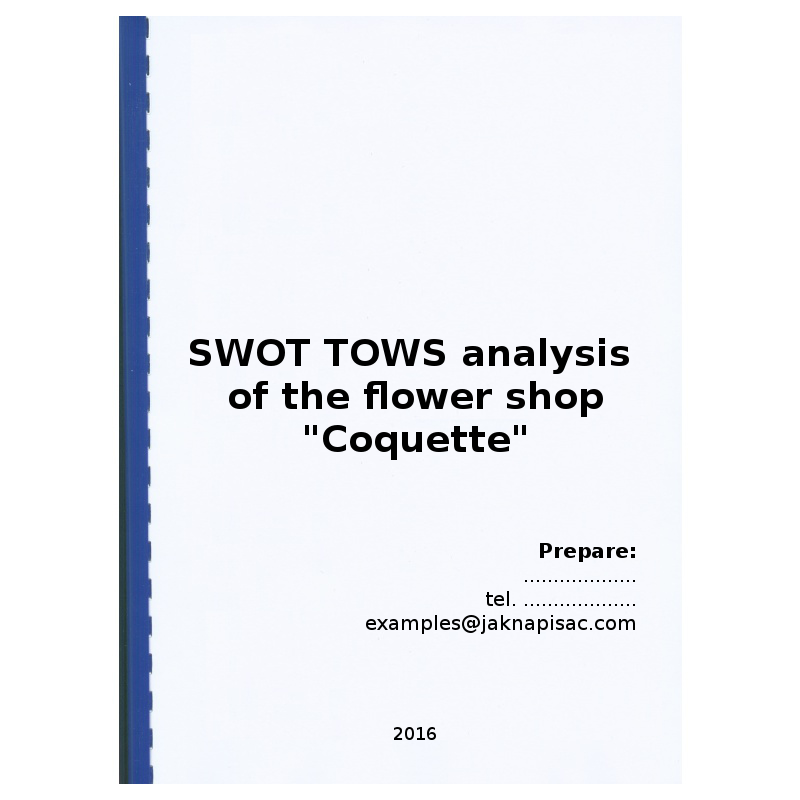 This article discusses what the SWOT/ TOWS analysis really is, and what is it comprised of. You will also get to know how to perform it, and how to build a strategy on its basis. SWOT is a complex method of strategic analysis of an organization, which takes into account both examination of the company’s interior, as well as of its external environment. It consists in identification of key assets and weaknesses of the company, and on confronting them with current and future opportunities and threats. SWOT is treated not only as one method of statistical analysis, but also as a concept of formulating a company’s strategy, which is while it is called the “SWOT analysis” (Jeżerys 2000: 85-86). In other words, SWOT is a manner of organization of facts, enabling comprehension of data and noticing the resulting consequences. It may be successfully applied in enterprises, as well as in other organization, e.g. political parties, public institutions, sport club, etc. 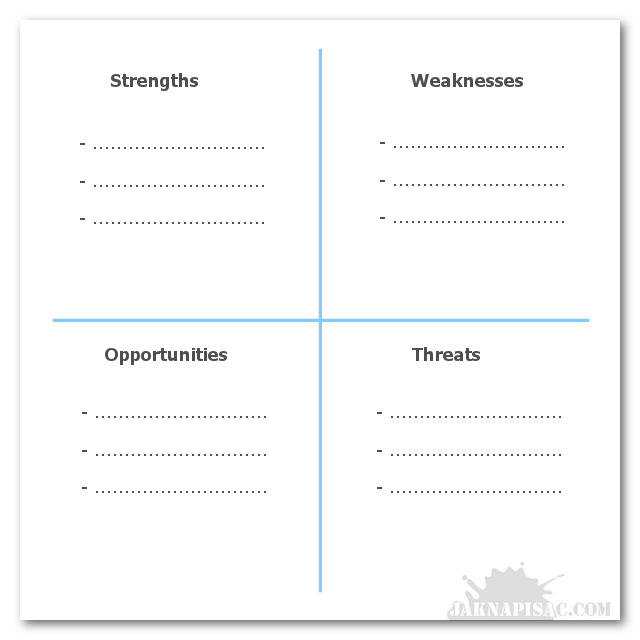 The SWOT method arises from a concept of force field analysis of K. Levin, developed in 1950s. However, this concept was to complex and strict to become applied in practice. In turn, it inspired to search for less careful but simpler methods, including the SWOT method among others. It is sometimes called SWOT/ TOWS approach. The TOWS name was created through rearrangement of letter in SWOT, and points to reversal of sequence of the analysis. While in the SWOT analysis, we start with evaluation of internal strengths and weaknesses and seek manner of the best application of them, taking into account the business environments, in case of TOWS analysis, we start with consideration of opportunities and threats in the company’s environment, which are then confronted with one’s own predispositions to use these opportunities and reduce dangers. threats – changes of internal factors, which may have negative influence on your company. Aim of the model presented below is to enable performance of SWOT/ TOWS analysis in practice. It is a combination of several approaches. A book by Krzysztof Obłój entitled Strategy of an organization turned out to be especially helpful. You need to choose the most significant features, those that bear strategic importance for the organization. There is no sense to focus on the less significant matters, remembering that it will be much work with those already selected. You need to choose crucial fields of company’s operation, and determine whether they are a strong or a weak side of the organization, as well as focus on the most significant opportunities and threats. To make it real, all selected features may be place in a table and provided with a rank. Afterwards, you take into consideration only those with the highest rank. 5 most significant features from every category undergoes further analysis. Prepare a detailed description of all features of your choice. Here, think again whether they have been classified correctly. Fill in the table below. Provide each feature with a weight, according to which you evaluate it (here you can apply e.g. a method of competent judges). Within separate categories, the weights need to sum up to 1,00. 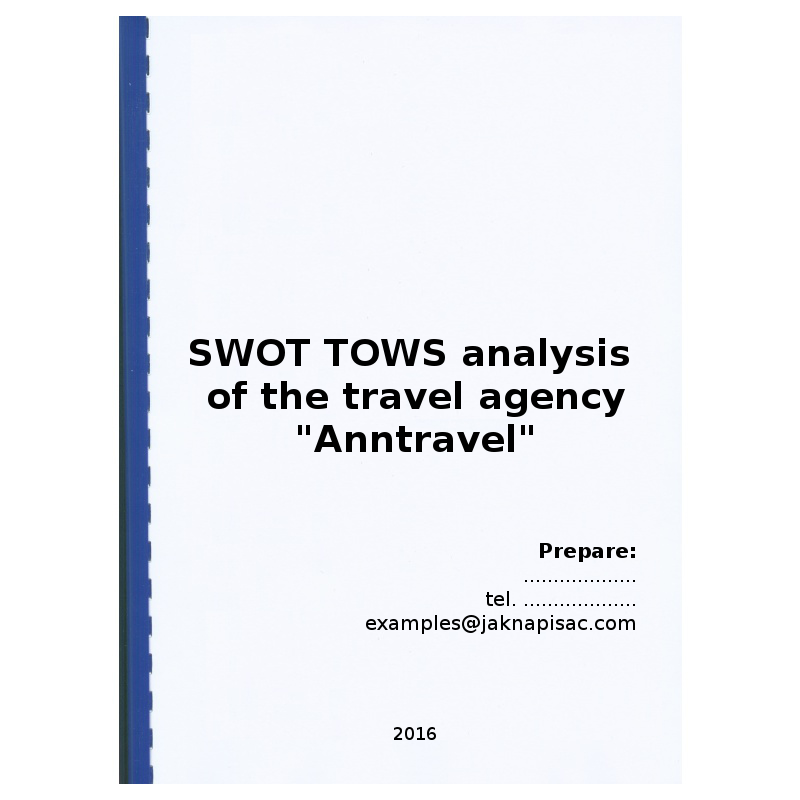 Performance of SWOT/TOWS analysis requires provision of answers for several key questions. Do the identified strong sides allow to take the opportunities? Do the identified strong sides allow to fight the threats? Do the identified weak sides hinder application of opportunities? Do the identified weak sides strengthen influence of the threats? Do the opportunities multiply the strong sides? Do the threats weaken the strong sides? Do the opportunities allow to fight the weak sides? Do the threats multiply the weak sides? To provide and answer for every questions, you can use a scheme. You need to prepare 8 pivot charts, and in each of them place the features identified earlier. If there is an interdependence, you place “1”, and if there is no interdependence, you place “0”. In the “weight” column and line place the previously agreed weights for each of them. “Number of interactions” means the sum of existing interdependencies. “The product of weights and interactions” means multiplication of a weight and interaction and placement of the result. The filled in “rank” is from “1” to “5”, in accordance to the product of weights and interactions. You put “1” in the place, where it is the highest. Where it is the lowest, you place “5”. The rank determines force of the feature. The obtained results from SWOT/TOWS analysis place in the manner presented by the below list. Already now, while looking at this exemplary list, you are able to provide the most adequate strategy. 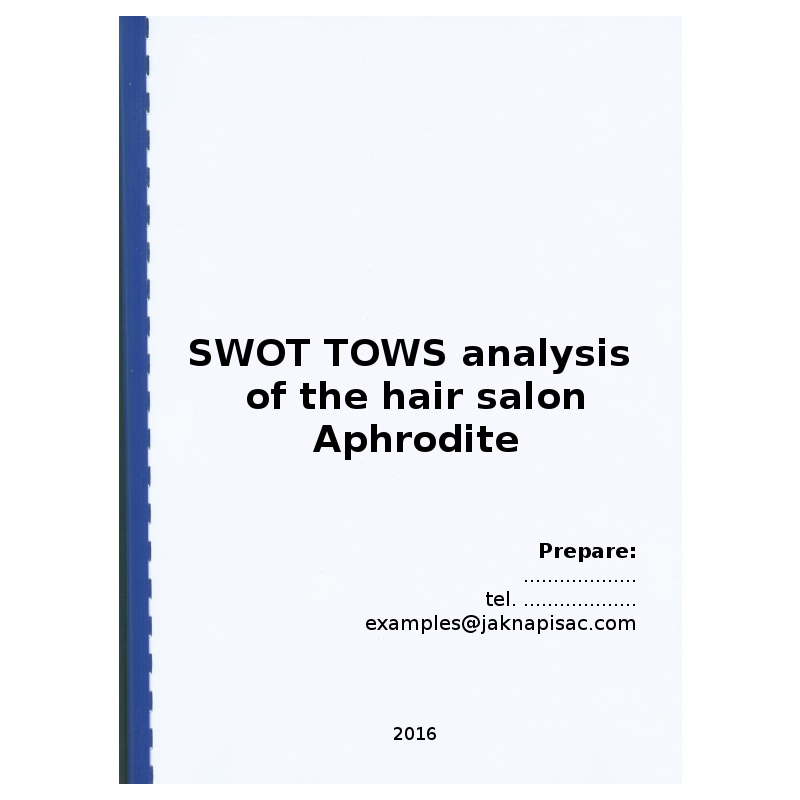 The obtained consolidated results of SWOT/ TOWS analysis point that with defined configuration of internal and external factors, and with a determined system of weights, the most desirable variant will be an action based on using strong sides and opportunities. The highest number of interactions and the weighed number of interactions highlight a strategy that should be chosen for your company/ organization. For indicators from the table, this would be an aggressive strategy, including application of strong sides and opportunities appearing int he surrounding. Refers to an organization, within which the strong sides are prevailing, and opportunities are dominating in the environment. It consists in strong expansion and development, with maximum application of strong sides and opportunities. According to Krzysztof Obłój (2007: 337-338) “the aggressive strategy (maxi – maxi) consists in maximum exploitation of the synergy effect present between the strong sides of the organization and opportunities generated by the environment. It is a strategy of strong expansion and diversified development (…)”. 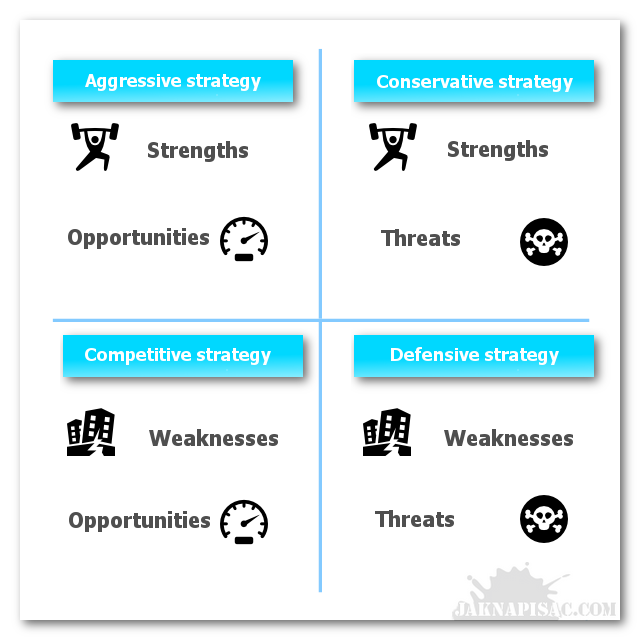 The aggressive strategy embracer such actions as: capturing opportunities, strengthening position on the market, taking over organizations of the same profile, concentration of resources on competitive products. It is a strategy that exploits a synergy effect of company’s strong sides and opportunities that appear in the environment (Klasik 1993: 112). It is present in an organization in a situation, when with high internal potential, it undergoes unfavorable system of external conditions. The threats need to overcome with use of the strong sides, e.g. the competitor should be bought and its shares taken over (Gierszewska i Romanowska 2009: 194). The conservative strategy embraces such actions as: selection of products, market segmentation, reduction of costs, improvement of competitive products, development of new products, searching for new markets. It is a strategy, where success of an organization is mainly sought in its strong sides and reduction of threats (Klasik 1993: 112). It is present in an organization, where weak sides dominate over the strong ones, and opportunities prevail in the environment. It consists in application of appearing opportunities, with simultaneous reduction of weak sides. The competitive strategy consists in “(…) elimination of weak sides of company’s operation and construction of its competitive strength through maximal exploitation of the existing opportunities that support development” (Obłój 2007: 338). The competitive strategy embrace such actions as: expansion of financial resources, improvement of commercial resources, improvement of a line of products, improvement of productivity, reduction of costs, maintenance of competitive advantage. It is a strategy that embraces construction of a competitive strength of an organization (Klasik 1993: 111-112). This strategy enables survival in a situation, when an organization works in an unfavorable environment, it is deprived of strong sides. It may lead to take maximal benefits from the company before its liquidation, or to combine it with another enterprise. The defensive strategy encompasses such actions as: gradual withdrawal, reduction of costs, reduction of productive ability, ceasing the investment process. It is a strategy that provides survival, through counteracting weak sides and threats (Klasik 1993: 111). 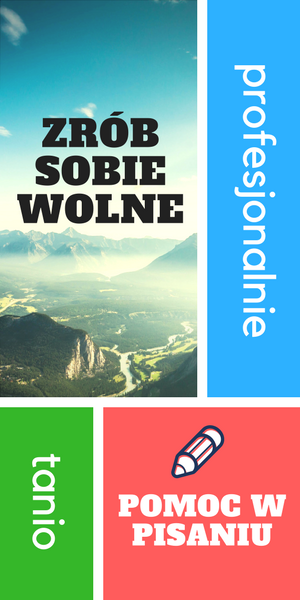 Previous articleHow to write a profile of a perfect candidate for a work position?